A rule when camping outdoors and in survival, in general, is to know how to efficiently use your consumables. If you have a portable stove or heater that utilize gasoline, it would be best if you are to maximize the use of such equipment. One option you can take to make sure your gas-powered equipment or vehicle last as long as possible is by using fuel additives. Fuel additives are compounds that you add into your gasoline. It is designed to enhance the efficiency of the fuel. It also acts as lubricators and as corrosion resistant chemicals. Basically, it optimizes the motor, increases the compression ratio to deliver a higher output of power, and enhances the all-around performance. This is why I do recommend fellow campers to have their own fuel additives for their heater, stove, vehicle or any other gas-powered equipment. But how do you choose the best fuel additives for your equipment? First, let me give you a list of the best fuel additives in the market. Afterwards, we will take a closer look on how to choose as well as the advantages of having a fuel additive on hand. This is a well-known brand when it comes to producing high-quality high-performance synthetic fuel system lubricants. Royal Purple was actually recommended to me by a friend who often goes on off-road camping trips. After a bit of research, I was able to gather some of the advantages of Royal Purple. It has been known to prevent stalling problems and uneven idling issues. It also helps restore engine horsepower on almost all types of engines. This is a huge plus if you are not really that well-versed in this kind of product as Royal Purple is basically a one-fits-all fuel additive. It is also designed for corrosion prevention which further helps improve engine performance. Compatible with a wide range of motor vehicles and fuel systems. Easy to find as it is available in almost every hardware store. The manufacturer has a solid reputation. Might need more than a couple injections to see significant improvement for some car owners. 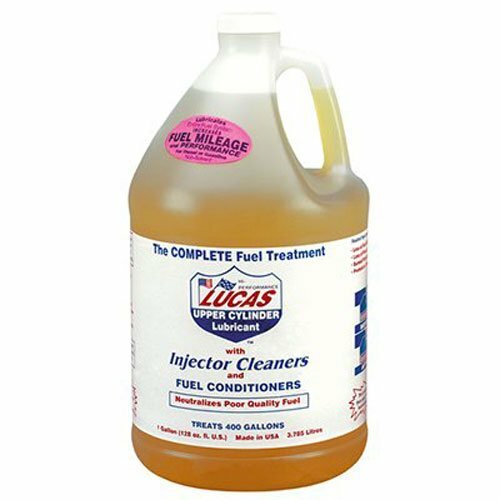 The Lucas 10013 Fuel Treatment is available in a 32-ounce bottle. This means it is enough to treat 100 gallons of fuel (either diesel or gasoline). It also acts as a fuel conditioning agent which means it can help revitalize your motor’s fuel system. The Lucas 10013 Fuel Treatment has been tested and proven to improve the durability of the fuel injector as well as the pump. It also helps clean out toxic emissions within the engine. As for why I chose this as my number 1 pick, it’s simple really; it has been one of the most prominent brands of fuel additive in the market while also being reasonably priced. You should check whether this fuel additive is compatible with your motor vehicle before making a purchase. Ask the staff to help you determine that little important factor. Delivers decent cleansing as well as lubrication to your fuel system engine. It helps improve the mileage of your vehicle. Eliminates toxic emission, thus reducing pollution. As a cleaning compound, it does not match up to other products that are specifically designed to clean fuel systems. The Liqui Moly 2007 is a fuel additive that also acts as a fuel system cleaner. It helps remove carbon deposits that might clog fuel pipes and fuel distributor injection valves. This fuel additive can help reduce engine failures, lower pollution emissions, smoother handling, and better throttle response. Of course, it can make fuel consumption more efficient. The Liqui Moly 2007 Jectron is ideal for motors and fuel system with catalytic converters. Overall, this is an extremely affordable fuel additive that still manages to deliver above average quality engine performance enhancing capabilities. This fuel additive is quite easy to use. Simply pour the fuel additive into a fuel tank that is ¼ to 1/8 full and let it dissolve for a while. While it comes with two containers, it only offers a relatively low amount of the compound. Depending on where you will use it, you will most likely need to purchase two packs. Gold Eagle unveils the STA-BIL 360 Performance fuel additive that is designed to significantly improve the performance of ethanol-based fuel systems. The manufacturer, Gold Eagle, has been around for decades and has since developed a pretty solid reputation in terms of quality. STA-BIL is currently one of their top products. STA-BIL is designed to be compatible with not just vehicles but also other motor fuel based engines like boats, snowmobiles, etc. It also utilizes the vapor technology that helps increase protection below and above the fuel line system. Other than basic engine performance enhancing qualities, STA-BIL also offers cleansing properties. It can help prevent corrosion and assists in removing water inside the fuel system. Great fuel system maintenance choice for long duration storage of vehicles. A great solution to prevent ethanol disease in your motor engine. An ideal stabilizer for vehicles operating in cold climate areas. Not compatible with diesel engines. The biggest eye-catcher with the Howes Diesel Treatment, for me, is its anti-gel capabilities. Living in an area where the temperature can dip constantly into the double-digit negatives means I need to take some extra steps to maintain my RV. This fuel additive is designed for cold weather protection and is a smarter option than mixing kerosene. This fuel additive offers protection from asphalt buildup that can clog the fuel system over time. As stated earlier, it is also a great option for those living in climates that regularly dip into sub-zero temperatures. Ideal for cold climates as it prevents your fuel from gelling up. It lubricates the fuel system and helps remove trapped water. I created the list above in order to narrow down your choices of fuel additive. Of course, it’s always better to share knowledge on how I chose the list of products above. This should help you further pinpoint the exact type of fuel additive that is suitable for your specific needs. You should always check the potency and overall cost of said fuel additive. The cost of using fuel cleaner and lubricant additives can really add up over time so it is best to make sure that each serving delivers maximum results. Always check for customer testimonials. These are free peeked into how effective and potent fuel additives are. I recommend you get the products that offer maximum potency with a reasonable price tag. Know what you need. There are several types of fuel additives available, each pertaining to specific uses. Some are made for storage, others are made for enhancing engine performance, while there others made for cleaning the engine/fuel system. Each additive will have specific compounds designed to offer solution for specific problems. You should always read the labels of the fuel additive to know where and how to use these compounds. It goes without saying that your vehicle is a huge investment and as such must be taken care of to ensure it lasts for as long as possible. I have an RV that is close to 6 years old now and as an outdoor enthusiast, I make sure it remains in tip-top shape. It has already brought me and my family some unforgettable experiences. Taking care of it is just a fair trade for where it is able to bring me and my family, right? 1. It helps save you cash in the long run – Fuel additives help improve and maintain the performance of your vehicle, effectively prolonging its lifespan. This also helps lower the chances of the engine and/or fuel system breaking down. Thus, eliminating several future repair bills on your budget. 2. Cleans the engine – Again, this ties to the first reason/benefit. As fuel additives help clean toxic emission and gunk in your engine it helps reduce the number of trips you need to go to your local mechanic. 3. Improves overall fuel efficiency – Using fuel additives help improve the overall fuel consumption of your vehicle. Meaning every single drop of gasoline is used. Fuel additives can actually enhance the MPG of your vehicle significantly. 4. Easy to use – One of the best things about fuel additives is how easy it is to use. You don’t need an advanced understanding of your vehicle’s engine to use it. You simply pour a certain amount into your fuel tank and let it dissolve. The only thing you need to keep in mind is to use it regularly to maximize the benefits it will deliver to your fuel system. As an RV owner and constant hiker/camper, taking the necessary steps to ensure my vehicle is in peak performance is a necessity. One of the cheapest and easiest ways to maintain my vehicle’s performance is by using fuel additives. As a camper, I cannot stress how important it is for you to use a fuel additive. As a top recommendation, I suggest you take a gander at the Royal Purple Fuel Cleaner. It delivers amazing results in terms of cleaning my RV’s engine and making sure it runs smoothly. I’ve actually been using that product for quite some time and recommend to other vehicle owners. I hope this article helped you determine why and which fuel additive to use. If you have anything else to add to the discussion, please feel free to comment down below.